Roundworms that feed on plants cause approximately $100 billion in annual global crop damage. Now researchers at the University of New Hampshire have made a patent-pending discovery that certain enzymes in roundworms, called nematodes, behave differently than the same enzymes in humans, with amino acids potentially playing a key role. The findings, presented in the journal PLOS ONE, are important because they advance scientific efforts to develop new, more environmentally friendly pesticides to manage nematodes and reduce worldwide damage to agricultural crops such as corn, cotton, wheat, soybean, rice, and potato. "Plant parasitic nematodes are responsible for major losses in crop production in the United States and around the world," said Rick Cote, professor of molecular, cellular, and biomedical sciences and researcher with the New Hampshire Agricultural Experiment Station. "Current chemical nematicides are highly toxic to humans, hence the need for 'next-generation' nematicides that lack adverse effects on agricultural workers and the environment. Our work identified phosphodiesterase enzymes as novel targets for development of safer, more sustainable nematicides." In addition to Cote, the research was conducted by Kevin Schuster, doctoral student in biochemistry; Mohammadjavad Mohammadi, doctoral student in chemical engineering; Karyn Cahill and Suzanne Matte, former research staff; Alexis Maillet, undergraduate student in biomedical sciences; and Harish Vashisth, assistant professor of chemical engineering. Specifically, researchers focused on phosphodiesterase enzymes (PDEs). All animals use PDEs to regulate many physiological processes, including motility, reproduction, and sensory perception. Previously, Cote and Schuster found that exposure of living nematodes to certain compounds, called PDE inhibitors, impede the action of PDEs, hampering nematode movement and its ability to sense food in its environment. The hope is that applying nematode-specific PDE inhibitors to agricultural fields could prevent plant parasitic nematodes from infecting plant roots. In this study, researchers compared the reactions of a human PDE— specifically PDE4—to the reactions of the nematode PDE4 when they applied the same PDE inhibitor to each enzyme. They found that in all cases, the PDE inhibitors they tested were less successful in hindering the nematode enzyme activity compared with the human enzyme activity. This led Vashisth and Mohammadi to study, at the atomic level, which amino acids in the PDE4 enzymes are responsible for these pharmacological differences. They discovered that certain amino acids as well as differences in the overall structure of the two enzymes contribute to the reduced effectiveness of PDE inhibitors to block the nematode enzyme action. UNH has filed a patent for this discovery, which is available for licensing through UNHInnovation. "By having shown that nematode PDEs significantly differ in their sequence and structure, we envision being able to design chemical nematicides that selectively target plant-parasitic nematodes. Nematicides targeting nematode PDEs would have the added advantage of not affecting crops, since plants lack PDEs, and being environmentally friendly to animals and humans," Schuster said. Researchers are expanding their study of the effects of applying PDE inhibitors to living nematodes. "We believe certain nematode PDEs may control vital physiological processes required for finding food or reproduction, and that inhibiting nematode PDEs may be lethal or cause sterility. The long-range direction for this research is to use the knowledge gained from this study to design new compounds that selectively inhibit nematode PDEs without affecting other animal PDEs," Cote said. 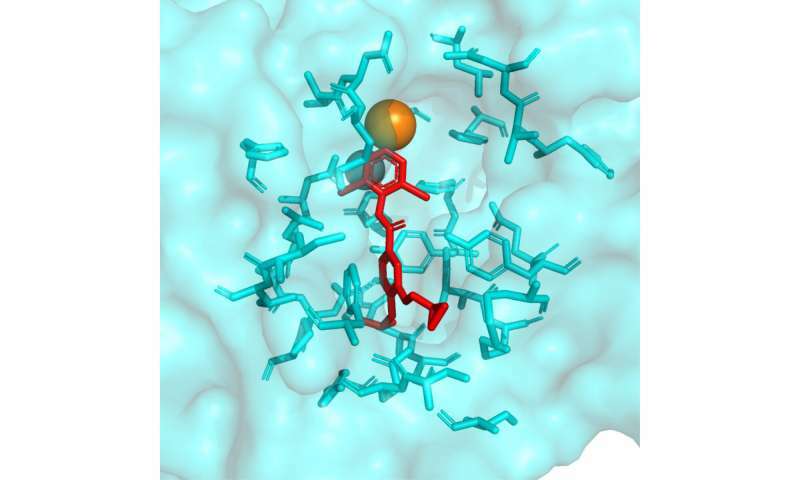 The research is presented in PLOS ONE in "Pharmacological and molecular dynamics analyses of differences in inhibitor binding to human and nematode PDE4: Implications for management of parasitic nematodes."